Put out fires, catch criminals and uncover the town’s dark secret. It’s my first day as a police officer in Flashing Lights, and I’ve just received my first call. “Aggressive driver in red vehicle seen in area, locate and stop,” the dispatcher says. I’m an untested rookie with a crisp uniform and a new car, and putting a stop to a road tyrant sounds like a great way to cut my teeth on this whole policing business. I squeeze my grotesque body, this vague approximation of a human that the game has seen fit to curse me with, into my car and speed off down the street. The engine buzzes like it’s 1986 and I’m playing Out Run. I spot the perp and make him pull over the only way I can: by smashing into him. We both crash, but our invincible, weightless cars are fine. Getting Speed Racer back to the station takes time as I click through small, cumbersome menus to search him, cuff him and then cram him into my car, which is also now completely stuck. As I rev up the engine, I can feel him judging me. I get out and slam into the car, dislodging it with my cop strength. My second call tasks me with catching another red car, which I do, but with less enthusiasm. I’m trying to figure out how to use my car’s broken computer when I get another call. “Aggressive driver in red vehicle…” I don’t read the rest. The red cars have won. I quit the force and sign up to become a firefighter. The streets of this nondescript town were not really made for fire engines. It quickly becomes clear that the coolest thing about being a firefighter, aside from saving lives, is actually its greatest weakness. It’s a profound realisation that I get to stew on as my truck gets stuck on yet another slip road. After putting out nothing but bin fires, which just involves standing still and pointing a hose, I finally get the opportunity to pry open a car door and rescue someone. This is what I should be doing all the time, not putting out fires set by bored teens. Once again I visit the job centre, but this time it’s going to stick. Most emergencies in Flashing Lights are roadside emergencies, a trend that continues when my ambulance and I are sent to the site of another car accident. I’ve used extinguishers and handcuffs, but now I get to push people around on stretchers. More responsibility! Returning, I see the man has politely stayed put. After a lot of faffing, I finally get him onto the stretcher and take him to the hospital. It’s during this drive that I realise he looks familiar. Bald head, white vest… I’m sure I’ve arrested him for speeding. And didn’t I free him from a car? I look out the window. There he is again, in the car in front of me. Behind me, he’s crossing the road. Everywhere I look, it’s the same guy. They’re all the same guy. Panicking, I get out of the ambulance and flee, but I can’t escape him. I’m trapped in his world now. 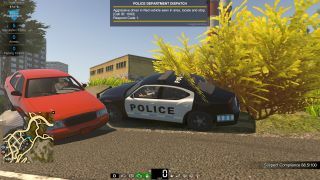 Flashing Lights: Police Fire EMS is launching on Steam Early Access on June 7. It's also available from our PC Gamer Club partners Fanatical at a discount.